In this Japanese name, the family name is Honda. Ishirō Honda (本多猪四郎, Honda Ishirō, 7 May 1911 – 28 February 1993), sometimes miscredited in foreign releases as "Inoshiro Honda", was a Japanese film director and screenwriter. He is best known for his kaiju and tokusatsu films, including several entries in the Godzilla series, but also worked extensively in the documentary and war genres earlier in his career. Honda was also a lifelong friend and collaborator of Akira Kurosawa, and worked with Kurosawa extensively during the 1980s and 1990s. Honda was born in Asahi, Yamagata (now part of the city of Tsuruoka) and was the fifth and youngest child of Hokan and Miho Honda. He had three brothers: Takamoto, Ryokichi, Ryuzo, and one sister: Tomi, who passed away during her childhood. Honda's father and grandfather were both Buddhist monks at Churen-ji, a temple in Mount Yudono, where the Hondas lived in a dwelling on the temple's property. The Hondas grew rice, potatoes, daikon radishes, and carrots. They also made and sold Miso and soy sauce. The family also received income from a silk moth farm managed by one of Honda's brothers. Honda's father earned income during the summers by selling devotions in Iwate Prefecture, Akita Prefecture, and Hokkaido and would return home before the winter. While Honda's brothers were given religious tutoring at sixteen, Honda was learning about science. Takamoto, who became a military doctor, encouraged Honda to study and sent him scientific magazines to help, which started Honda's love for reading and scientific curiosity. In 1912, the Hondas moved to Tokyo where they settled in the Takaido neighborhood of the Suginami ward and where Hokan became the chief priest at a Buddhist temple. Though he was an honors student back home, Honda's grades declined in Tokyo and in middle school; he struggled with subjects involving equations such as chemistry, biology, and algebra. After his father transferred to another temple, Honda enrolled in the Tachibana Elementary school in Kawasaki and later in Kogyokusha Junior High where Honda studied kendo, archery, and athletic swimming but quit after tearing his Achilles tendon. Honda met Kimi Yamasaki in 1937 and proposed to her in 1939. Honda's parents and Kimi's mother were supportive, but Kimi's father was opposed to the sudden engagement. Though Kimi's father never approved of her marriage, he nonetheless sent her ¥1,000 upon learning of her pregnancy. Rather than having a traditional wedding ceremony, the two simply signed papers at city hall, paid their respects at Meiji Shrine, and went home. Honda became interested in films when he and his classmates were assembled to watch one of the Universal Bluebird photoplays. Honda would have often sneaked to a movie theater without his parents' permission. For silent films in Japan at that time, onscreen texts were replaced with "benshi", narrators who stood beside the screen and provided live commentary, which Honda found more fascinating than the films themselves. Honda's brother, Takamoto, had hoped for Honda to become a dentist and join his clinic in Tokyo but instead, Honda applied at Nihon University for their art department's film major program and was accepted in 1931. The film department was a pilot program, which resulted in disorganized poor conditions for the class and cancelations from the teacher every so often. While this forced other students to quit, Honda instead used the cancelled periods to watch films at theaters, where he took personal notes. Honda and four of his classmates rented a room in Shinbashi, a few kilometers from their university, where they would gather after school to discuss films. Honda had hoped for the group to collaborate on a screenplay but they mainly just socialized and drank. Honda attended a salon of film critics and students but hardly participated, preferring rather to listen. While in school, Honda met Iwao Mori, an executive in charge of production for Photographic Chemical Laboratories (PCL). In August 1933, Mori offered entry level jobs at PCL to a few students, including Honda. Honda eventually completed his studies while working at the studio and became an assistant director, which required him to be a scripter in the editing department. Honda eventually became a third assistant director on Sotoji Kimura's The Elderly Commoner's Life Study (1934). However, Honda then received a draft notice from the military. At 23 years old, Honda was drafted in the fall of 1934. Despite receiving a passing grade on his physical examination, he was not required to report for immediate duty. While waiting for his call up, Honda continued working at PCL. Honda was then called to duty in January 1935 and was enlisted into the First Division, First Infantry Regiment in Tokyo. At the time, Honda began his training at the entry-level rank of Ippeisotsu, the equivalent of Petty Officer First Class. In 1936, Honda's former commanding officer, Yasuhide Kurihara, launched a coup against the civilian government, what would be called the February 26 Incident. Though Honda had no involvement with the coup, everyone associated with Kurihara were considered dangerous and the brass wanted them gone and as a result, Honda and his regiment were sent to Manchukuo in 1936, under questionable pretense. Honda would have completed his 18 remaining months of service had it not been for the coup and would be recalled to service again and again for the remainder of the war. Honda was recalled to service in mid-December 1939, a week before his daughter, Takako, was due to be born. Having already risen in rank, Honda was able to visit his wife and daughter in the hospital but had to leave afterwards immediately to China. Between 1940 and 1941, Honda was assigned to manage a "comfort station", a euphemism for brothels established in occupied areas. Honda would later write an essay titled Reflections of an Officer in Charge of Comfort Women published in Movie Art Magazine in April 1966, detailing his experiences and other comfort women's experiences working in comfort stations. Honda would then return home in December 1942, only to find that PCL (now rebranded as Toho by that point) were forced to produce propaganda to support the war effort. The government took control of the Japanese film industry in 1939, modeling the passage of motion picture laws after Nazi policies where scripts and films were reviewed so they supported the war effort and filmmakers noncompliant were punished or worse. Honda's son, Ryuji, was born on 31 January 1944, however, Honda received another draft notice in March 1944. He was assigned to head for the Philippines but his unit missed the boat and were sent back to China instead. To Honda's fortune, the conflict in China was less intense than it was in the Pacific and Southeast Asia. Honda became a sergeant and was in charge of trading and communicating with civilians. Honda never ordered the Chinese as a soldier and was respectful to them as much as possible. Honda was eventually captured by the Chinese National Revolutionary Army and relocated to an area between Beijing and Shanghai for a year before the war ended. During his imprisonment, Honda stated to have been treated well and was even befriended by the locals and temple monks, who offered him to stay permanently but Honda respectfully refused in favor of finding his wife and children. As a parting gift, the locals gave Honda rubbings of Chinese proverbs, imprinted from stone carvings of sacred temples. Honda would later write these verses in the back of his screenplays. During his final tour, Honda escaped death near Hankou when a mortar shell landed before him but did not detonate. When the battle ended, Honda later returned to retrieve the shell and took it back home to Japan where he placed it on top of his desk in his private study until his death. Honda then returned home in March 1946, however, throughout most of his life, even as an old man, Honda would have nightmares about the war two or three times a year. During his entire military service, Honda served three tours, with a total of six years serving at the front. Honda returned to work at Toho as an assistant director. In 1946, he worked on two films: Motoyoshi Oda's Eleven Girl Students and Kunio Watanabe's Declaration of Love. In 1947, he worked on three films, 24 Hours in an Underground Market (jointly directed by Tadashi Imai, Hideo Sekigawa, and Kiyoshi Kusuda) and The New Age of Fools Parts One and Two, directed by Kajirō Yamamoto. Due to issues with trade unions and employees at Toho, many left to form Shintoho. Kunio Watanabe tried to convince Honda to join Shintoho, with the promise of Honda becoming a director quicker, however, Honda chose to remain neutral and stayed at Toho. Despite struggling at Toho, Honda worked on a handful of films produced by Film Arts Associates Productions. Between September and October 1948, Honda was on location in Noto Peninsula working on Kajirō Yamamoto's Child of the Wind, the first release from Film Arts. From January to March 1949, Honda worked with Yamamoto again on Flirtation in Spring. Between July and September 1949, Honda reunited with his friend Akira Kurosawa and began working as a chief assistant director on Kurosawa's Stray Dog. Honda mainly directed second unit photography, all of the footage which pleased Kurosawa and has stated to "owe a great deal" to Honda for capturing the film's post-war atmosphere. In 1950, Honda worked on two films by Kajirō Yamamoto: Escape from Prison and Elegy, the last film produced by Film Art Associations. Honda had also worked as an assistant director on Senkichi Taniguchi's Escape at Dawn. In 1949, before being promoted to a feature film director, Honda had to direct documentaries for Toho's Educational Films Division. Toho sometimes used documentary projects as tests for assistant directors due to become directors. Honda's directorial debut was the documentary Ise-Shima, a 20-minute highlight reel of Ise-Shima's cultural attractions. It was commissioned by local officials to boost tourism to the national park. The film covers a brief history of the Ise Grand Shrine, the local people, the economy, and pearl farms. The film is also notable for being the first Japanese film to successfully utilize underwater photography. Honda originally wanted to use a small submarine-like craft but the idea was scrapped due to budget and safety concerns. Instead, professional divers assisted with the production. Honda had commissioned a camera technician colleague who designed and built an air-tight, waterproof, metal-and-glass housing for a compact 35 millimeter camera. Story of a Co-op was a documentary about the rise of consumer cooperatives in post-war Japan. It was also written by Honda, with the production overseen by Jin Usami and with the support of the Ministry of Health and Welfare. Some records indicated that some animation was used to explain the functions of co-ops but these reports have been unconfirmed. The film was completed on 6 October 1950 and has since been lost. However, Honda recalled that the film was successful enough to convince Toho to assign Honda his first feature film. Between filming the documentaries, Toho had offered Honda the chance to develop and direct a war film titled Kamikaze Special Attack Troop. Toho then chose not to proceed with the project after finding Honda's script, which openly criticized leaders of World War II, to be too grim and realistic. Honda recalled that the studio felt it was "too soon after the war" to produce such a film. Had the project proceeded, it would have been Honda's first directorial feature. The script has since been lost. Honda's feature film directorial debut was The Blue Pearl. Released on 3 August 1951, it was one of the first Japanese feature films to utilize underwater photography and the first studio film to be shot in the Ise-Shima region. Honda initially chose not to direct war films, but changed his mind after Toho offered to have him direct Eagle of the Pacific, a film about Isoroku Yamamoto, a figure with whom Honda shared the same feelings regarding the war. It was the first film where Honda collaborated with Eiji Tsuburaya. He directed the original Godzilla along with King Kong vs. Godzilla (1962), Mothra vs. Godzilla (1964), Destroy All Monsters (1968), and many others until 1975. He also directed such tokusatsu films such as Rodan, Mothra and The War of the Gargantuas. His last feature film was Terror of Mechagodzilla (1975). The following years were spent directing various science fiction TV shows. The superhero shows Return of Ultraman, Mirrorman, and Zone Fighter were also his. In addition, he directed the cult film Matango. After retiring as a director, Honda returned more than 30 years later to work again for his old friend and former mentor Akira Kurosawa as a directorial advisor, production coordinator and creative consultant on his last five films. Allegedly one segment of the Kurosawa film Dreams was actually directed by Honda following Kurosawa's detailed storyboards. His most memorable quotation: "Monsters are born too tall, too strong, too heavy—that is their tragedy", when he spoke of his film Rodan a decade after his first Godzilla film. This statement alone would give fans the impression that his intent was to give all kaiju a distinct personality instead of just being a monster-on-the-loose. In 2009, the first book in English was published detailing Honda's life and genre films called Mushroom Clouds and Mushroom Men - The Fantastic Cinema of Ishiro Honda written by Peter H. Brothers. Ishiro Honda: A Life in Film, from Godzilla to Kurosawa is a 2017 critical biographical study of Honda's career by Steve Ryfle and Ed Godziszewski. Guillermo del Toro's Pacific Rim (a film that pays homage to the kaiju, tokusatsu, mecha, and anime genres) ends with a joint dedication to Honda and Ray Harryhausen. The episode, "Tagumo Attacks!!!" in the television series, Legends of Tomorrow, is based around Ishirō Honda. The central plotline of the episode involves Tagumo, a creature that Ishirō has written, which becomes a reality due to a magic book. It is described as a "land octopus" that will destroy Tokyo, unless the protagonists can stop it (it resembles a kraken-esque creature). At the end of the episode, the character, Mick Rory tells Ishirō to "Forget about the octopus. Lizards. Lizards are king." 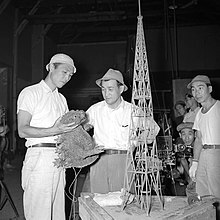 In this fictional universe, this will lead Ishirō to creating the character Godzilla, as he states in the episode "The King... of the Monsters. I like that". ^ Ryfle & Godziszewski 2017, p. 3. ^ a b c Ryfle & Godziszewski 2017, p. 4. ^ Ryfle & Godziszewski 2017, p. 5. ^ Ryfle & Godziszewski 2017, p. 6. ^ a b Ryfle & Godziszewski 2017, p. 7. ^ a b Ryfle & Godziszewski 2017, p. 8. ^ Ryfle & Godziszewski 2017, p. 23. ^ Ryfle & Godziszewski 2017, p. 24. ^ Ryfle & Godziszewski 2017, p. 25. ^ Ryfle & Godziszewski 2017, p. 9. ^ a b Ryfle & Godziszewski 2017, p. 11. ^ Ryfle & Godziszewski 2017, p. 12. ^ Ryfle & Godziszewski 2017, p. 13. ^ Ryfle & Godziszewski 2017, p. 15. ^ Ryfle & Godziszewski 2017, p. 16. ^ Ryfle & Godziszewski 2017, p. 26. ^ a b Ryfle & Godziszewski 2017, p. 27. ^ Ryfle & Godziszewski 2017, p. 28. ^ a b Ryfle & Godziszewski 2017, p. 30. ^ a b Ryfle & Godziszewski 2017, p. 31. ^ a b Ryfle & Godziszewski 2017, p. 32. ^ a b Ryfle & Godziszewski 2017, p. 33. ^ Ryfle & Godziszewski 2017, p. 40. ^ a b c Ryfle & Godziszewski 2017, p. 45. ^ Ryfle & Godziszewski 2017, p. 44. ^ a b Ryfle & Godziszewski 2017, p. 48. ^ a b Ryfle & Godziszewski 2017, p. 49. ^ Ryfle & Godziszewski 2017, p. 51. ^ a b c Ryfle & Godziszewski 2017, p. 46. ^ Ryfle & Godziszewski 2017, p. 47. ^ Ryfle & Godziszewski 2017, p. 307. ^ Ryfle & Godziszewski 2017, p. 50. ^ Ryfle & Godziszewski 2017, p. 70. ^ Ryfle & Godziszewski 2017, p. 53. ^ Ryfle & Godziszewski 2017, p. 59. ^ Ryfle & Godziszewski 2017, p. 72. ^ Ishiro Honda: A Life in Film, from Godzilla to Kurosawa, 3 October 2017, by Steve Ryfle and Ed Godziszewski. ^ Faraci, Devin (1 July 2013). "Guillermo Del Toro On Classic Kaiju And Why Pacific Rim Doesn't Feature Robots". Birth.Movies.Death. Retrieved 7 October 2017. ^ Galbraith IV 2008, p. 5. ^ Galbraith IV 2008, p. 6. ^ Galbraith IV 2008, p. 7. ^ Galbraith IV 2008, p. 12. ^ Galbraith IV 2008, p. 13. ^ a b Galbraith IV 2008, p. 14. ^ Galbraith IV 2008, p. 15. ^ Galbraith IV 2008, p. 20. ^ Galbraith IV 2008, p. 22. ^ Galbraith IV 2008, p. 73. ^ Galbraith IV 2008, p. 74. ^ a b c Phillips & Stringer 2007, p. 110. ^ Galbraith IV 2008, p. 82. ^ Galbraith IV 2008, p. 84. ^ Galbraith IV 2008, p. 89. ^ Galbraith IV 2008, p. 94. ^ Galbraith IV 2008, p. 96. ^ Galbraith IV 2008, p. 99. ^ Galbraith IV 2008, p. 106. ^ Galbraith IV 2008, p. 108. ^ Galbraith IV 2008, p. 111. ^ Galbraith IV 2008, p. 113. ^ Galbraith IV 2008, p. 123. ^ Galbraith IV 2008, p. 127. ^ Galbraith IV 2008, p. 128. ^ Galbraith IV 2008, p. 130. ^ a b c Galbraith IV 2008, p. 134. ^ Galbraith IV 2008, p. 136. ^ Galbraith IV 2008, p. 140. ^ Galbraith IV 2008, p. 142. ^ Galbraith IV 2008, p. 146. ^ Galbraith IV 2008, p. 149. ^ Galbraith IV 2008, p. 153. ^ Galbraith IV 2008, p. 155. ^ Galbraith IV 2008, p. 159. ^ Galbraith IV 2008, p. 160. ^ Galbraith IV 2008, p. 162. ^ Galbraith IV 2008, p. 176. ^ Galbraith IV 2008, p. 183. ^ Galbraith IV 2008, p. 185. ^ Galbraith IV 2008, p. 190. ^ Galbraith IV 2008, p. 194. ^ Galbraith IV 2008, p. 203. ^ Galbraith IV 2008, p. 206. ^ Galbraith IV 2008, p. 210. ^ Galbraith IV 2008, p. 212. ^ Galbraith IV 2008, p. 213. ^ Galbraith IV 2008, p. 215. ^ Galbraith IV 2008, p. 221. ^ Galbraith IV 2008, p. 225. ^ Galbraith IV 2008, p. 231. ^ Galbraith IV 2008, p. 233. ^ Galbraith IV 2008, p. 234. ^ Galbraith IV 2008, p. 240. ^ Galbraith IV 2008, p. 251. ^ Galbraith IV 2008, p. 258. ^ Galbraith IV 2008, p. 261. ^ Galbraith IV 2008, p. 268. ^ Galbraith IV 2008, p. 269. ^ Galbraith IV 2008, p. 281. ^ Galbraith IV 2008, p. 300. ^ Galbraith IV 2008, p. 322. ^ Galbraith IV 2008, p. 343. ^ "Dreams". Criterion Collection. Retrieved 11 May 2017. ^ Richie 1998, p. 260. ^ Galbraith IV 2008, p. 382. ^ Galbraith IV 2008, p. 383. ^ a b c d e f g h i j k l m n o Ryfle & Godziszewski 2017, p. 302. ^ a b c d e f g h i j k l m n Ryfle & Godziszewski 2017, p. 303. Alastair, Phillips; Stringer, Julian, eds. (2007). Japanese Cinema: Texts and Contexts. Routledge. ISBN 1134334222. Richie, Donald (1998). The Films of Akira Kurosawa. University of California Press. ISBN 0520220374. Ryfle, Steve; Godziszewski, Ed (2017). Ishiro Honda: A Life in Film, from Godzilla to Kurosawa. Wesleyan University Press. ISBN 9780819570871. Wikimedia Commons has media related to Ishirō Honda.